If you want to attract more birds to your yard and enjoy those birds better yet, this is the book for you. And there is no better authority to teach us than author Jim Carpenter, founder of the wildly successful Wild Birds Unlimited retail stores. Carpenter’s expertise and insight have been honed not only through study, but through interactions with thousands of backyard birding and nature enthusiasts. This book presents that wisdom in a fun, easy-to-read, lavishly illustrated format that is part novel and part reference book. You’ll want to read through it and then keep it on your shelf for periodic consultations. Let’s face it: for most beginners, bird feeding involves buying a feeder and whatever seed is handy and hanging the feeder from a tree limb in the yard. That, of course, is why so many novices fail to attract birds and end up with rodent problems or gobs of moldy food that doesn’t get consumed. 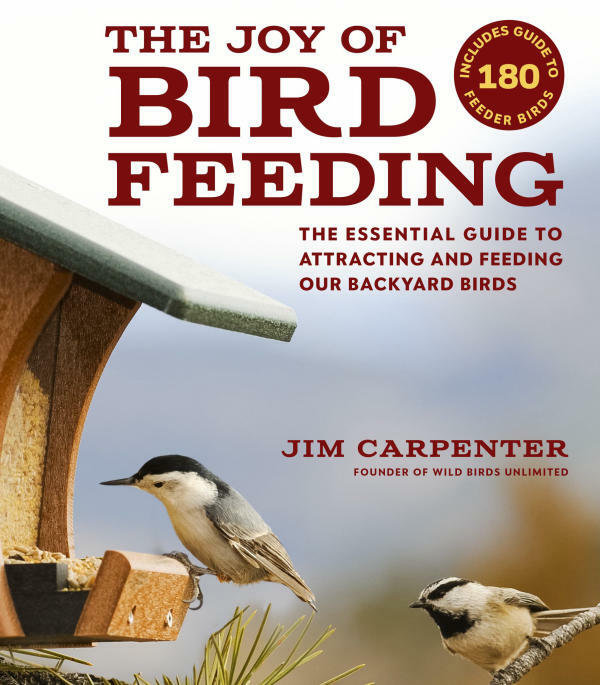 Carpenter helps readers avoid this peril with the “Five Steps to Bird Feeding Mastery,” which includes testing seeds to find those most attractive to birds in your area, improving bird habitats, and paying attention to seasonal changes in bird food preferences. Carpenter’s “12 Elements of a Thoughtful Bird Feeding Station” walks readers through a step-by-step process to maximize bird diversity and abundance and, most importantly, keep birds safe. The Joy of Bird Feeding includes information about how to identify more than 180 species of yard birds, each with a map illustrating nesting, wintering, year-round, migration and rare ranges. Many species accounts include insights about bird behavior that you just won’t get in a field guide. Carpenter doesn’t shy away from tough but important topics, such as problems with squirrels and hawks, bird diseases, window strikes and woodpeckers drilling holes in the siding on your house. Collectively, these issues discourage thousands of people from starting or continuing their feeding stations. Carpenter’s wisdom can help minimize or eliminate these challenges. I’ve been feeding birds for more than 50 years and quite honestly, I didn’t think I’d find many new items in this book, but boy, was I wrong! With Carpenter’s guidance, I’m now more adept at interpreting bird seed labels to make sure I know what I’m buying. I avoided bird food cylinders for years, thinking they were just gimmicks, but now they are part of my feeding station. Bark butter is next. Who knows, I might even try fried fish! (You’ll have to read the book to learn more about this one! ).